See also: Buffaloes; Peace Movement; Secession Movement. Unionists in North Carolina were citizens who opposed the state's secession from the Union prior to and during the Civil War. After Abraham Lincoln won the presidency in November 1860, the dominant issue in North Carolina was whether the state should leave the Union and join other southern states in a new confederacy. The election of Lincoln, who had pledged to prevent the further extension of slavery, created alarm and despair for the future of North Carolina and the other southern states. The 1860 ballot, however, showed that most North Carolinians opposed secession. William W. Holden, editor of the Raleigh-based North Carolina Standard, rejected secession and urged North Carolinians to "watch and wait" until Lincoln and the Republican Party gave tangible proof of their intentions. Federal Whigs, such as William A. Graham, John M. Morehead, and George E. Badger, denied the right as well as the expediency and wisdom of secession. A minority group of radical Democrats, led by Governor John W. Ellis, favored secession because of Lincoln's election. The events of the winter of 1860-61 steadily weakened Unionist support in the state. In January 1861 the legislature-yielding to increasing pressure passed the Convention Act, authorizing a vote on 28 February to determine whether to call a convention and to elect 120 delegates to serve if the referendum passed. Of the 120 delegates chosen at the election, 28 were conditional Unionists, 50 were unconditional Unionists, and 42 were secessionists. Fearing that a convention might lead to secession, however, the voting public turned it down 47,323 to 46,672. Although most North Carolinians still had no desire to secede, the firing on Fort Sumter and Lincoln's call for troops placed them firmly in the secessionist camp. Governor Ellis informed U.S. secretary of war Simon Cameron that North Carolina would send no troops to aid the government in Washington. In short, the firing on Fort Sumter, Lincoln's call for troops, and his subsequent proclamation blockading southern ports unified the state far more effectively than all the previous arguments of the secessionists. Unionists as well as secessionists applauded the governor's firm stand. All Unionist newspapers, including Holden's North Carolina Standard, went over to the secessionist side. Ellis acted promptly to prepare the state for secession and war. On 1 May 1861 he called for 30,000 volunteers and convened a special session of the General Assembly. That body adjourned 13 days later, the date it had fixed for electing delegates to a convention on the secession question. The convention assembled at Raleigh on 20 May with 120 delegates present. Within an hour after the adoption of an ordinance of secession, the convention ratified the provisional Constitution of the Confederate States of America. The Unionist cause in North Carolina was not completely extinguished by the state's entry into the Confederacy. Through the leaders of the peace movement, the radical Heroes of America, the guerrilla Buffaloes, and many other formal or informal political groups, fervent Unionism continued to fuel conflicts among the citizenry throughout the war. Daniel W. Crofts, "Union Party of 1861 and the Secession Crisis," Perspective in American History 11 (1977-78). Richard Nelson Current, Lincoln's Loyalists: Union Soldiers from the Confederacy (1992). John C. Inscoe and Robert C. Kenzer, eds., Enemies of the Country: New Perspectives on Unionists in the Civil War South (2001). 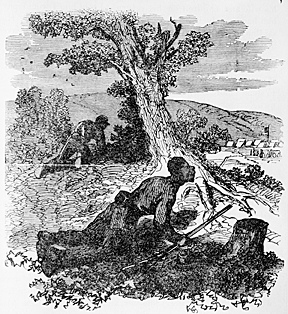 "The Freedmen as union Scouts." From the General Negative Collection, North Carolina State Archives, Raleigh, NC., call #: N_76_8_223. Available from http://www.flickr.com/photos/north-carolina-state-archives/5573811565/ (accessed May 18, 2012).